Post subject: Twin-turbo V6 for Holden Commodore? This could be Holden's answer to Ford's potent Falcon XR6 Turbo. General Motors has shown off a twin-turbocharged engine based on the 3.6-litre V6 used in the Holden VF Commodore. The new motor makes a V8-beating 313kW and 583Nm, 43kW and 53Nm more than the current 6.0-litre V8 in the SS and will be linked to an eight-speed paddle-shift automatic transmission in Cadillac’s new CTS sedan. 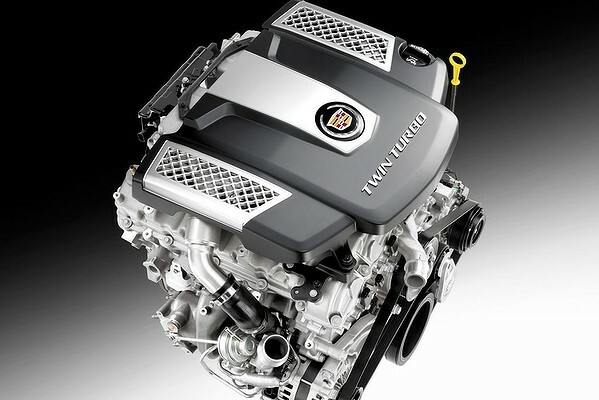 Cadillac says the engine “brings a new dimension of technologically advanced performance “ to the brand and develops 90 per cent, or about 520Nm, of its torque from only 2000rpm. The engine would give Holden an answer to Ford's popular turbocharged XR6, as it is based on the engine used in the Commodore SV6. But the twin-turbocharged unit has several key departures from the Commodore engine, including new cylinder block and head castings and strengthened internals. The brand’s director of external communications, Craig Cheetham, poured cold water on the idea of a twin-turbo Commodore in the short term. “There are no firm plans to introduce it to Holden,” he says. The new VF Commodore SS is expected to retain Holden’s current V8 engine, which puts out 260kW as an auto and 270kW as a manual. GM’s local arm has previously flirted with turbocharging for the Commodore, in the form of a $3.5 million concept car shown in 2005. The hot pink Torana TT36 concept car had a similarly twin-turbocharged version of the Commodore V6 which pushed out 280kW and 480Nm of grunt. The Holden engine plant in Port Melbourne also built turbocharged six-cylinder engines for Saab before the Swedish marque collapsed in 2012. BTW, a build update is required, it need to be in the form of, "The motor has been installed and is due to be tuned in the next fortnight" If not, go and do it. Nice boat anchor you have there. Bucket of s**t compared to a BARRA Inline 6. That's why holden rebadging company won't go for it. Back then they were talking about bringing them out, 8+ years later and still nothing but talk from them about it. as it is based on the engine used in the Commodore SV6. I see a problem here for Holden. They say it is 'based' on the SV6 motor, and then they throw away the base... and the head... and the internals... so essentially, its nothing like the SV6 motor... meaning they would be shelling out premium dosh for one. They cant get that sort of power for the sort of money they would be asking ot of the regular SV6, so it aint gonna happen. Ford tried the TTv6, and couldn't get near the mark set by the Barra's. Ford of the US has a twin turbo 3.5 V6 on sale now, fitted to the Taurus, has 365 hp and 350 ft/lb with direct petrol injection. I found that funny too...based on the SV6 engine but different everything. Do what they will, they will most likely not sell many (but more than XR6-Ts unfortunately) due to buyers preferring smaller ve-hicles now. Fuel economy and saving the environment stuff. Unless this V6TT can better the fuel economy of a small car (4-6L/100km REAL life), I don't see this picking up at all. Chuck a turbo diesel option into the Commodore will most likely gain more sales. Tis a bit off topic, my bad. Everyone in Europe pretty much drives a diesel, that's why everyone here wants one too, trendy and cool. Although, the more people buy diesel, the better the chances the infrastructure will evolve and change to accommodate. The 4 cylinder turbo was pretty good...albeit most likely poor at towing, it was a good test drive as an every day car IMO...the issue here was marketing, my 5 neighbours didn't know a 4 cylinder existed. Anyways I think that's a debate already discussed some where else. Back on topic me think. Just to take this further off-topic, I'm pretty sure you'll find the modern diesel offerings in passenger cars do offer far better fuel economy and the drivability and general experience is better than a similar sized (or even larger) petrol offering in the same vehicle. I did some time in a 2.0TDI Passat which delivered around 850-900km per tank for city driving. The same model vehicle in the petrol 3.6 V6 configuration is lucky to get half that in the same conditions. We all know the V6 petrol is a bigger engine and ultimately produces more power, but the torque offered from both cars is on par - and this is what's important for city stop/start driving, overtaking and has the most influence on the "Seat of the Pants" scale. I think the 0-100km/hr for the Diesel is around 1 second slower than the petrol, not bad for 40-50% saving in running costs.